Can't see anything to indicate a fossil. Also can't offer any useful alternative. Sorry. It does me too; if it were perfectly spherical I would have no reservations suggesting that as the ID (and I still think it is ceramic). Can't really see if there are any conchodial cracks in the photo. If there were, it would suggest a round silicate type stone. I'm leaning toward ceramic, too. I was going to suggest the inside of a golf ball. But it doesn't appear to be perfectly round and it looks a bit too big. So I'll suggest alien coprolite. My very first thought was also ceramic. 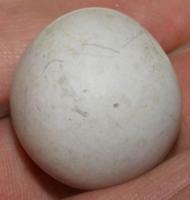 definitely a milling ball, as they wear they lose there perfect roundness. thank all of you very much for the info. would ceramic be easy to break? this item has been put into a vice and struck with various things with no damage. There are several possibilities here (and meteorite definitely ain’t one of them). Mechanical ball mills have a long history of use for reducing the size of particulate materials – originally for things like gunpowder manufacture and porcelain clay production; later (from around 1870) with the assistance of steam power for grinding pigments, pulverising flint fragments to make powdered silica for pottery production and even making the emulsion for chocolate candy etc. They come in all sizes, including huge ones used for ore-crushing. 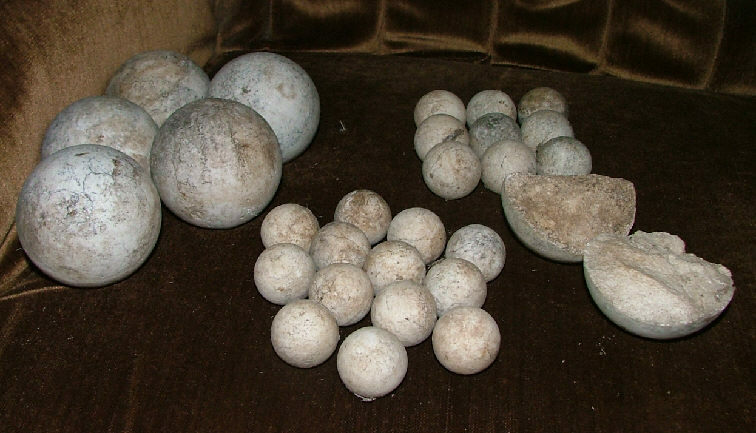 Older examples of milling balls were made from hardstones, then from ceramics including crushed stone fired to vitrification and then high tech ceramics (sometimes with a steel core that can easily be detected with a magnet). The older they are, the less likely they are to be perfect spheres (but they usually wear pretty evenly if they are spherical to begin with). 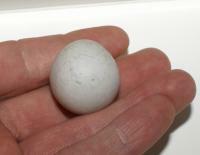 Marbles are the next possibility. 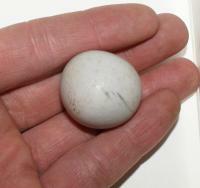 Marbles as we know them were first made in Germany in the 1800’s and were mass-produced from around the 1870’s onwards. Before American production began, they were sometimes used as saleable ballast in empty ships sailing to American ports to pick up cargoes – hence their popularity in America. My money would be on the last of those possibilities. Thanks for the journey into spheredom, Roger! With "TED Talks" like yours, the Forum should think about becoming a degree-granting institution! I have a question: how hard are the objects you describe? Though it hasn't been empirically tested, the mystery ball sounds to be really hard, certainly harder than pipe clay. It reminds me of something other than what has been mentioned. Oh and Roger, I feel a little like I just sat through a class of "Old School" engineering. Thank you too Auspex good question. Just how hard is this object? How could you get a non-destructive test? I too have some mystery stones like this one. I'll keep an eye on this subject for a while. Well i only tested it the "caveman" way using a hammer and vice. although, my grandfather who owns shouse tool co. in fenton mi which Makes Cubic Boron Nitride (CBN) and Polycrystaline Diamond (PCD) Inserts Has stated It's a minimum of a 7 on the hardness scale. I can ask him tomorrow what he used to come to this conclusion im pretty sure it wasnt a specific gravity test. my guess is he just started scratching it with different materials he had. He offered to try cutting it with a carbide wheel i declined. I Figured the wheel would win and i kinda liked the mystery. I can take it to him any day and have this done if need be. I was kinda hoping there would be value and i didnt know if it would hurt it by cutting the stone. I have heard of some type of calcium build-up in the bladders of some animals. I don't know what they are called, but I think I remember reading about them somewhere (possibly here). Anyone think it is possibly something organic along those lines? Thanks Auspex. You wouldn't believe how many spherical items turn up from digs that people believe to be artefacts (Native American game balls, slingshot balls and such)... so it pays to be aware of all the modern possibilities and geological oddities. I'm sure it's not geological and also sure it's not an organic item such as a gall-stone, bezoar etc that Ramo mentioned. They're usually composed of calcium phosphate/carbonate and easily crushed. Pipe clay (kaolin) can be hard (although brittle), depending on how high you fire it. When used for pipes it's not heavily fired since it's desirable to retain porosiity... it improves the smoking experience.  Anything which has had crushed stone added to it and has been fired to vitrification point will be hard and that potentially applies to all three items above. 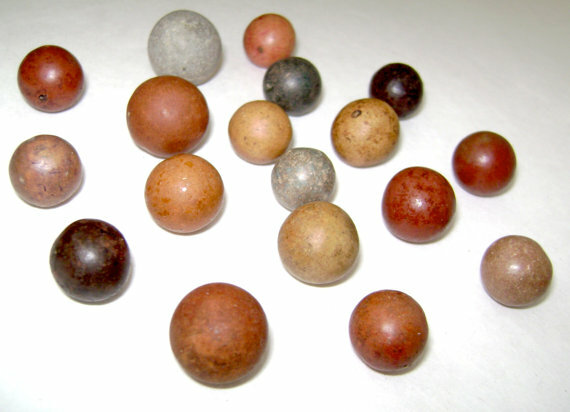 Early milling balls actually made from stone will usually be hard and not brittle, as will those made from clay/stone mixtures. They need to be harder than whatever they were being used to pulverize and so the hardness varies widely according to usage... the stone (whether whole or crushed) used to make them was selected accordingly. As usual Roger, I am amazed, dumbstruck and humbled by the depth of your knowledge. Cool item to find while tilling as well. I've found what appear to be clay marbles while sifting for fossils in the Peace River and its tributaries here in South Florida. 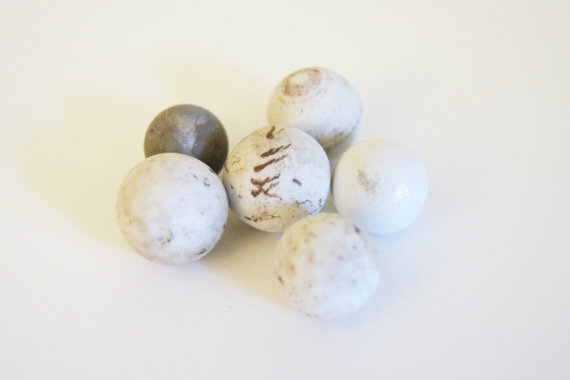 One of the oddest is a marble sized piece of white ceramic very similar to the marbles pictured above by MuseumTreasures via Etsy only it is far from round. It has slightly flattened sides giving it a rather handmade appearance. Looks kinda like something a bored student might make in a ceramics class. Maybe one day I'll post a photo to get the Forum's opinion of its past purpose. Could be. 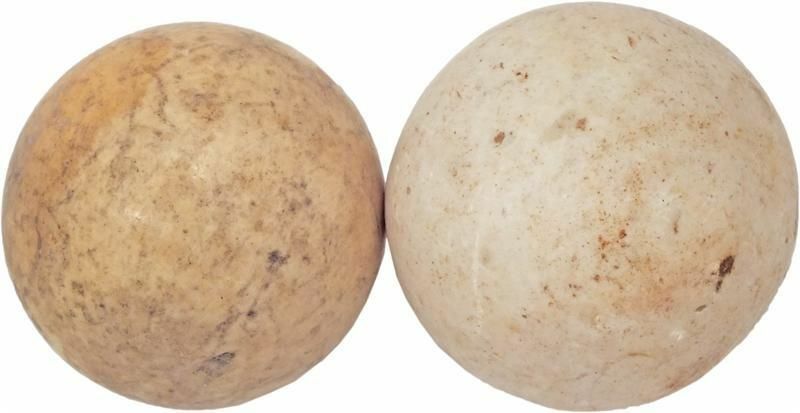 These balls go into a large drum together with the material you want to grind down. The drum is tipped sideways and then rotated on its axis. As well as the abrasive action of the material being ground, the balls will also polish against one another as they're tumbled around. Or you may just be seeing a smooth vitreous surface. Examination with a loupe for randomly oriented micro-scratches will tell you. Should i take this in and have it cut open? I am fairly certain that this would reveal it to be an homogeneous mass, and would not reveal anything that would aid its identification.